On Saturday night in San Antonio, Texas, Ohio Wesleyan's men's soccer team won its second NCAA Division III title by edging Calvin (Mich.) 2-1 in the championship game. This victory represents the second NCAA championship won by an AICUO member institution this academic year; the Wittenberg volleyball team won its tournament, also in Division III, last month. Ohio Wesleyan had defeated Montclair State (N.J.) 3-0 in the semifinal round on Friday. 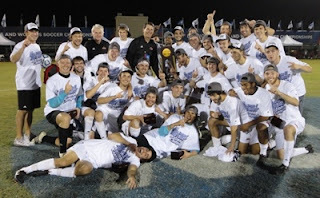 The final victory also set an NCAA record for Ohio Wesleyan's coach, Jay Martin, as it was his 608th, making him the all-time wins leader among soccer coaches. The championship came after team vans were robbed of equipment and personal items, including computers with school work, shortly after their arrival in San Antonio. This near disaster attracted national attention but the team overcame this obstacle as well as its opponents to claim the title. After defeating Madonna (Mich.) 4-1 and Belhaven (Miss.) 1-0, Rio Grande lost its quarterfinal game in the NAIA tournament 3-1 to William Carey (Miss. ), Dec. 1 at Orange Beach, Ala.